Calabash gourd (Hulu)-Lagenaria siceraria (Molina) Standl. Botanical Name: Lagenaria siceraria (Molina) Standl. Source of Earliest Record: Rihuazi Bencao. Part Used & Method for Pharmaceutical Preparations: When the calabash gourd ripens in autumn, its peel is collected and dried in the sun. Functions: To promote water metabolism and reduce edema. Indications & Combinations: Edema. 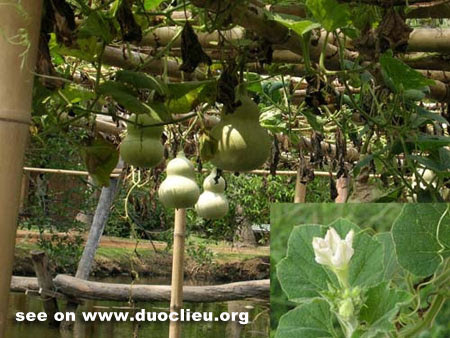 Calabash gourd (Hulu) is used with herbs which promote water metabolism, such as Benincasa peel (Dongguapi).